Reaganomics - What Does It Mean? What was "Reaganomics"? What were the fundamental pillars of "Reaganomics"? 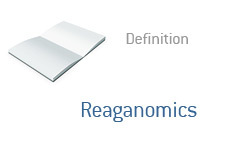 What does "Reaganomics" mean? In the early '80s, the United States was suffering through a multitude of different economic ailments. Inflation was high. Unemployment was on the rise. Stagflation (which is weak economic activity coupled with high inflation) was ravaging the economy of the United States. Ronald Reagan officially took office in January of 1981. With each passing month, the economy worsened, prompting Reagan and his team to unleash "Reaganomics" on the United States. 4. Tighter money supply to help to stamp out inflation. Another key element of "Reaganomics", as it would turn out, would be dramatically increased defense spending. This spending helped to dramatically increase the size of the national debt while Reagan was in office. In 1981, the United States posted a budget deficit of 79 billion dollars (real dollars). Just two years later, this number was up to $207.8 billion dollars. This works out to about $442 billion dollars in inflation-adjusted dollars. "Reaganomics" is credited with reviving the US economy during Reagan's first term as president, helping to earn him a second term in 1984. US citizens obviously believed that Reagan had the right idea, as Ronald Reagan won a total of 49 states in the '84 election. "Reaganomics" is also referred to as "trickle-down economics" and "supply-side economics".